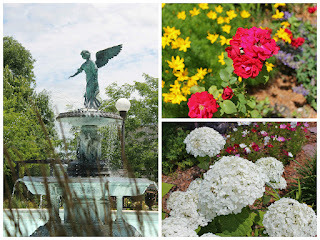 We arrived in Le Sueur, MN on July 7th. When we left Iowa we thought we had a nice 3-1/2 hour drive, well we would have if we hadn't picked the wrong route that took us 5-1/2 hours. Needless to say we were pretty tired by the time we got here and got set up. The drive provided some beautiful scenery, and we saw wind turbines in every direction we looked, while driving through the western side of Iowa. Some places had 60 to a 100. 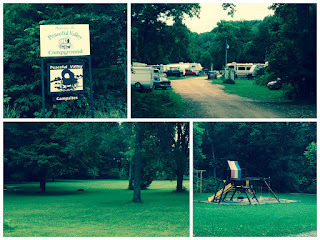 We are staying at Peaceful Valley Campgrounds, the name makes Nancy think of a cemetery or nursing home, it is a mile south of downtown Le Sueur. 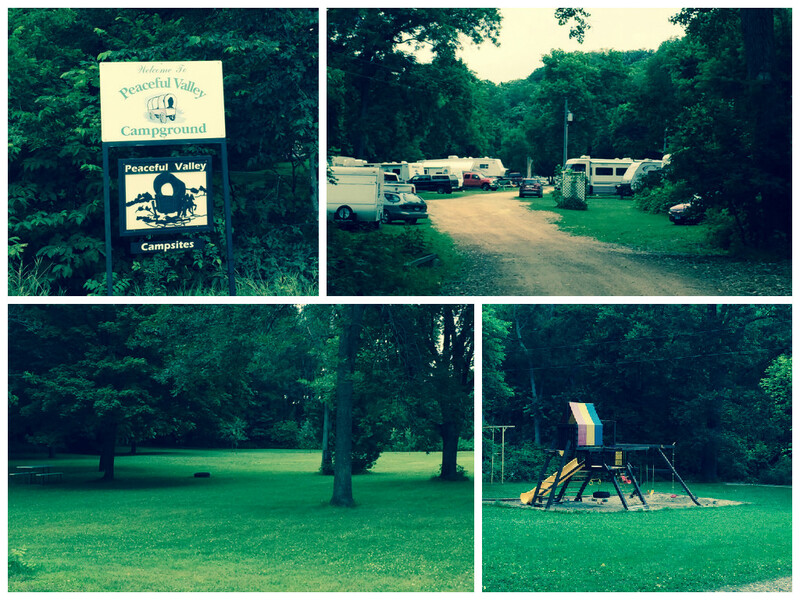 It is a small private campground, owned by John and Karen Brancamp and it has 32 sites. In the office is a small store with a few basic items, as well as a nice sitting area with couches and chairs and a large table. The only access to internet is in the office or just outside so the sitting area is nice for that, not convenient but nice. We had no phone service here either so no internet, Nancy was afraid of withdrawal. There is a small playground with a climbing structure and swings. A narrow little creek runs through the grounds, there had been 3" of rain the day before we arrived so it was running pretty well. The first night we headed into St. Peter for dinner, a fairly good sized town south of us. We really wanted Mexican food but couldn't find one, Les went into a party store to ask and found out that the only Mexican restaurant closed the day before because they were moving to a new location. Another customer suggested an Irish Pub, so we headed there, St Patrick's Pub and Bar, the place was packed as it was trivia night, once we got seated we were told it would be a 40 minute wait for food - grabbed the "On Tap" list and settled in. Strange Irish Pub - they had no fish and chips, but they did have pizza and burgers. Burgers were good, but nothing spectacular and the beer was great. We did discover that neither of us is any good at Trivia. When we stepped out our door the first morning we discovered we had a visitor, a huge dragonfly and he stayed for 24 hours then flew away. New Ulm, a is small German town, about 45 minutes away. 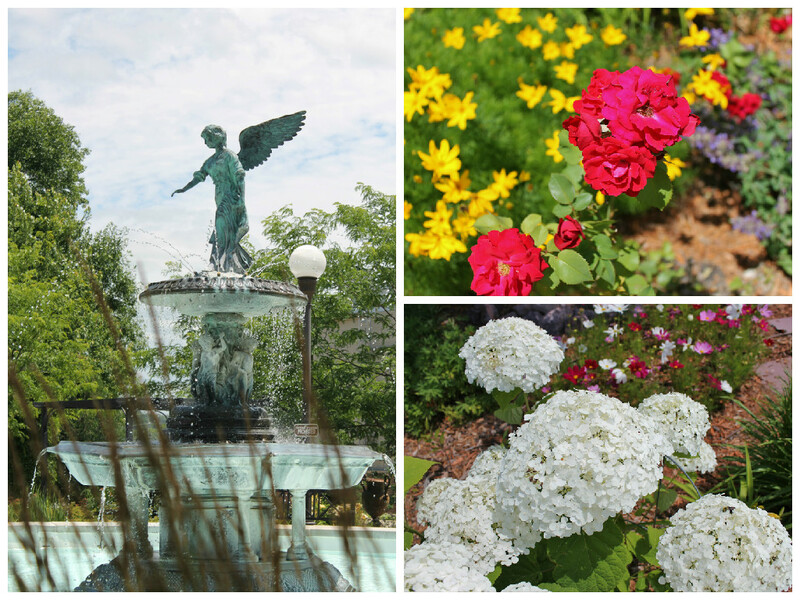 We explored a park where we found an angel fountain, which is a replica of one in New York City, surrounded by beautiful flower gardens. 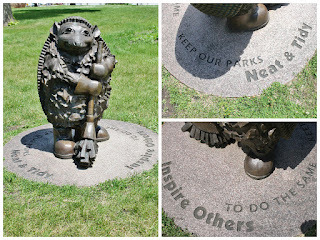 There is a German Bohemian Immigrants Statue and a cute little Hedge Hog statue, that for some reason made us think of Tina Berry. While trying to find Domeier's German Store, which was way more difficult than we expected we came across the town's Glockenspiel. Local contributors were joined by donors from three foreign countries, 31 states and 51 other Minnesota cites. This was the first free-standing carillon tower in North America. It is 45 feet tall and was dedicated on May 25, 1980, with 1500 people in attendance. The tower has 37 fully chromatic three-octave bronze bells, which were made in Holland and can be played electronically, or by keyboard. Ulm, West Germany, a Sister City to New Ulm, donated $8,000 to pay for the second largest of the 37 bells. The total cost of construction was $275,000. The 12 animated figures are changed out at Christmas with a Nativity scene. 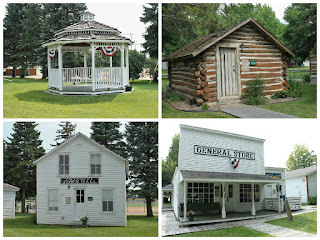 The daily ones depict the history of New Ulm and the stone and wood used to finish the tower are all from Minnesota. We could see a church tower as we drove through town. We headed in its direction to see the rest of the building. We discovered it was the Cathedral of the Holy Trinity. The building was beautiful, and there is a stature of Mary, Joseph and baby Jesus. We passed the Brown County Historical Building which reminded Nancy of a large gingerbread house. Once we found Domeier's store we were treated to a wall to wall, floor to ceiling display of everything German. You could hardly get past the display racks. We found a few little trinkets that tickled our fancy and of course some German chocolates. Last stop before leaving New Ulm was to see the Herman the German Monument, a nickname given to Arminius, a chieftain who led a coalition of Germanic tribes to victory in 9 AD over a Roman army in the Battle of the Teutoburg Forest. You can go inside and climb the stairs but we couldn't take the dog and Nancy wasn't sure she could handle the open metal stairs, so we admired it from outside the gate. 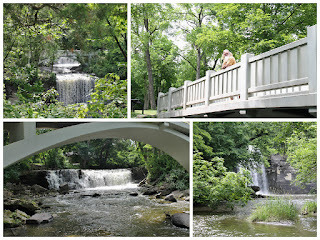 Minneopa State Park in Mankato, MN was our next stop. There are two water falls to see which are fairly close to the parking lot. Both can be seen from the walkway which is handicap accessible. You can also walk down to the rivers edge to get a closer look at the larger falls. This is a combination of stairs, paved walkway and climbing over tree roots and rocks. One of the rocks looked like big foot print steps. 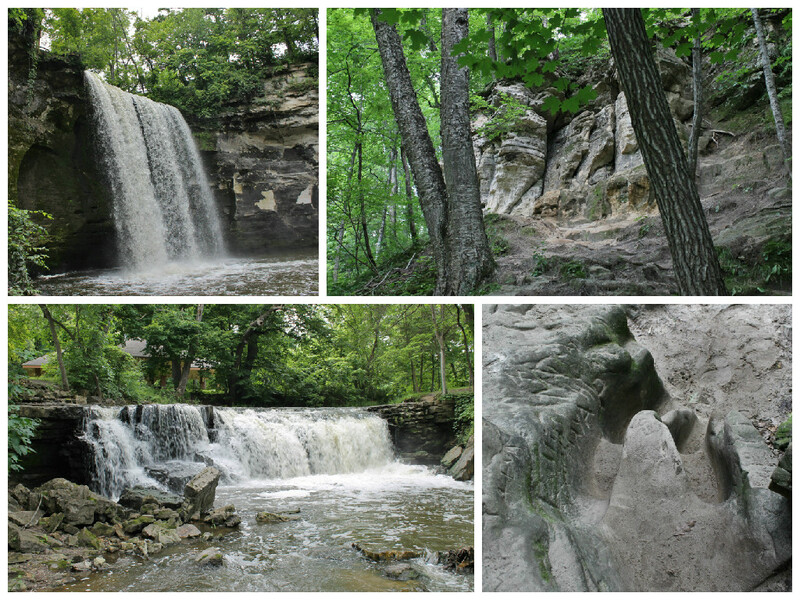 The falls were very pretty and the rock walls that line the river were amazing. Across the highway from the falls, but in the same state park is a prairie area and an old mill. You drive along a 3 mile road across the prairie to get to Seppman Mill. It was built by Louis Seppman, he started it in 1862 and finished it in 1864. The stone walls are 32 feet high. The base is 30 feet wide but tapers to 20 feet across. The walls are 2 feet thick and taper to 6" thick at the top. It has a wooden dome that could pivot on a track. There used to be a small platform that the miller liked to sit on and smoke his pipe. The arms, that are now missing, were covered with sailcloth and spanned 72 feet. The park hopes to replace the arms and sails at some point. 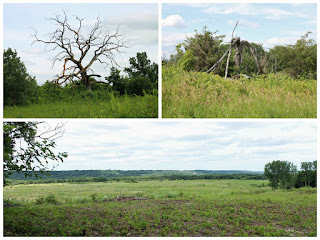 The view of the prairie from here was beautiful. There were some interesting trees along the way, a variety of birds and flowers as well. We of course found some Roadside Oddities in Minnesota and when we traveled back into Iowa. The Happy Chef in Mankto, MN and Pitchfork Pete in Albert Lee, MN. The Jolly Green Giant is in Blue Earth, MN. If you look close you will Les and Mielikki. We also found some more stored or abandoned trains in Iowa, about 5 miles of them. This is our second Peter Toth Indian carving. This one is called Big Indian Head and was dedicated on July 4, 1978. It is carved from a local cottonwood tree and is 33 feet tall. It is in a park in Iowa Falls. We found the Warrior King Jesus outside of the Christian Family Church in Owatonna, MN. A rare giant rendition of the Book of Revelation Jesus, on a stallion with sword and fighting spirit. 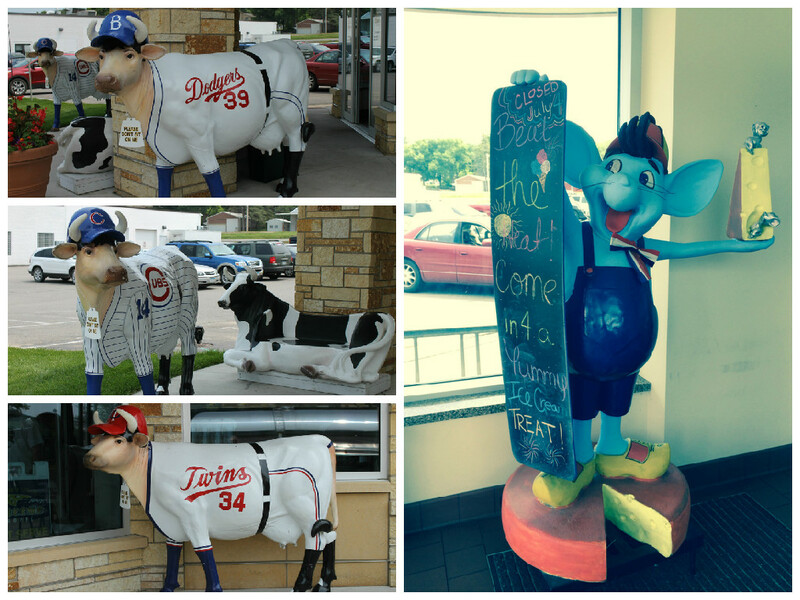 In downtown Le Sueur we found Baseball Cows and a very happy mouse at the Friendly Confines Cheese Shop. They had a great selection of cheeses, we got a very tasty assortment. As we entered back into Iowa on SR60 we stopped at Hawkeye Point in Sibley. 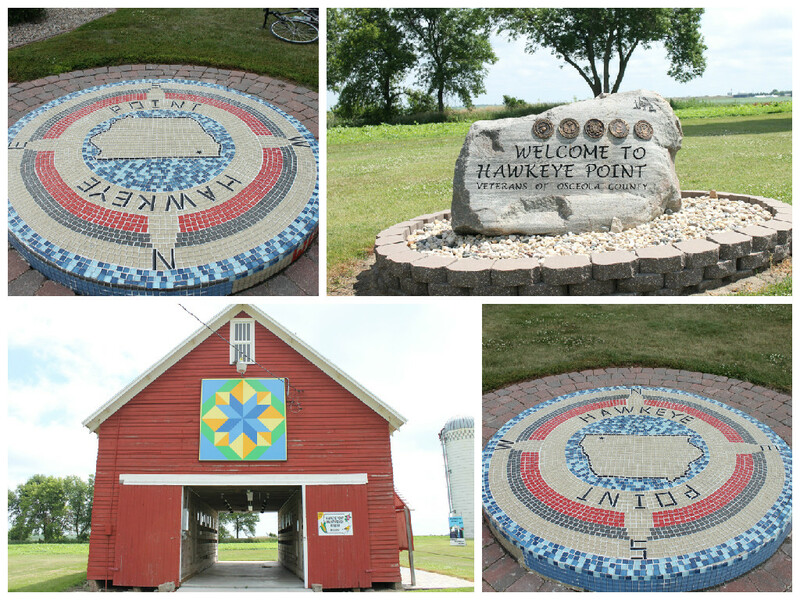 It is the highest point in Iowa at 1,670 feet. Which of course we found rather funny. While there we had a chance to chat with four young people who are part of a Michael J. Fox Foundation team. Tour de Fox is headed by Sam Fox, who is riding and climbing to all the highest and lowest points in the U.S. He has a crew of three people with him. We helped out and took a picture of them in front of the mile marker posts. What an inspiration they are, Sam is riding for his mom who has Parkinsons. The direction signs state the name, distance and elevation of all of the highest points in the U.S. Mt. Mitchel, NC is 891 miles away with an elevation of 6,684 feet. Just a little higher than here, but not nearly as high as other places. Our travels took us through La Mars, IA which is home to Blue Bunny Ice Cream, so while stopped to get a picture of the large sundae we of course had to go inside and sample some! We saw this lighthouse which appears to be in the middle of a corn field but we later found out it is the welcome sign to a nearby city. We have discovered that Sinclair Gas in still popular in Iowa, and some of the stations still have the large green dino in front of them. This one scared Mielikki. We found a whole town of oddities when we got into Ida Grove, IA. Byron LeRoy Godbersen, a wealthy businessman who founded GOMACO, a road building equipment company loved castles and loved Iowa. 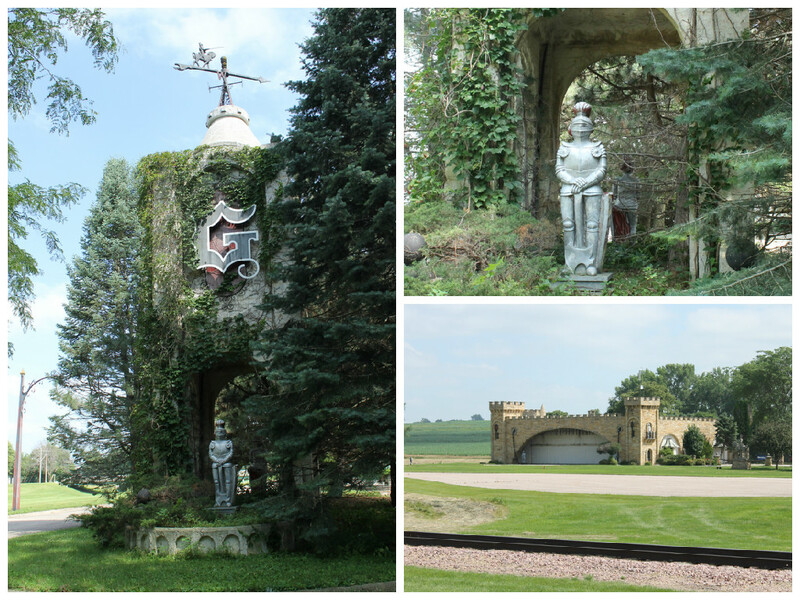 He didn't want to leave Iowa so he built castles all over town. He also had his employees build a half-scale replica of the H.M.S. Bounty. 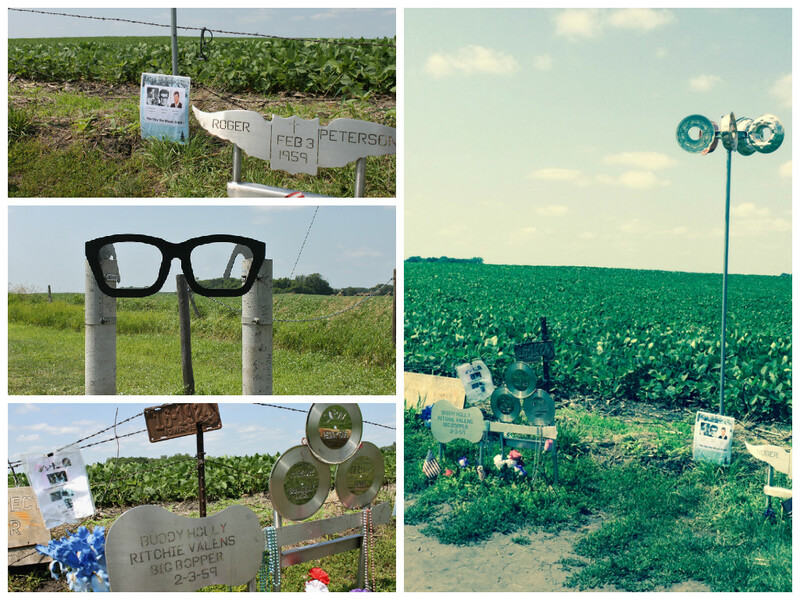 that took the life of Buddy Holly and three other people. It is just north of Clear Lake and it is in the middle of a corn field. You find the trail head by the large black glasses that are stationed at the edge of the road. There were two other couples and a lady there at the same time as we were. They were all from the area but had never stopped before. 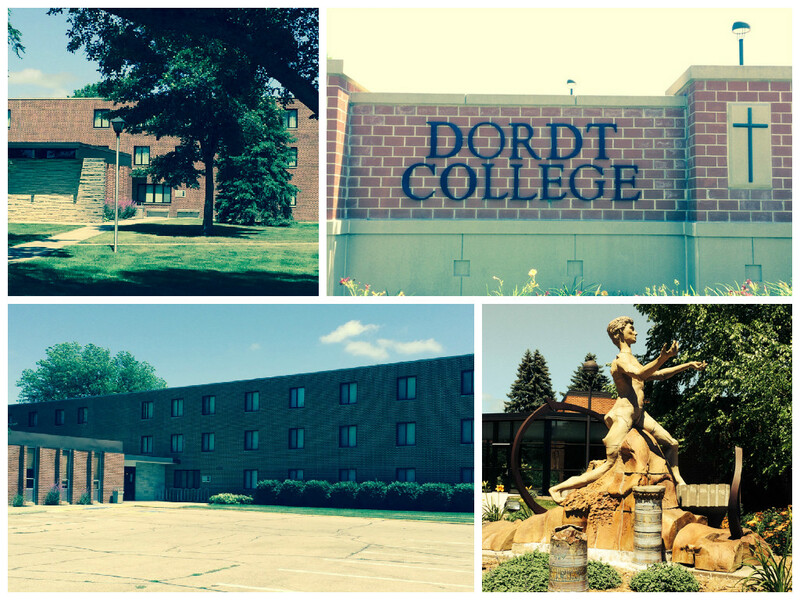 The one thing that took us back to Iowa was a visit to Dordt College in Sioux Center. It was actually closer to our stay in Minnesota than where we were staying in Iowa. We also visited the Grotto of Redemption on the same day but that story will have to wait for another blog. Les attended Dordt College his freshman year. It also is in the middle of corn fields. In was fun walking down memory lane. A lot has changed in the 40+ years since he was there. Iowa has the most unique Rest Areas we have ever seen. Some have themes, one outside of Iowa City is book themed. All are sponsored by businesses and all have free WiFi. The one we stopped at is a two story barn with a gift shop, historical information and a coffee shop that served sandwiches and pie. The last oddity of this stay was found in Minnesota. Just west of Blue Earth is the spot where the construction of I-90 coming from the west met up with the construction coming from the East. There was a big celebration and ribbon cutting ceremony and the last section of road that was laid had gold mixed into the cement. Both the east and west bound have this gold strip on the shoulder of the road. Construction was completed in 1978. Officials came up with the idea of the gold cement from the "Golden Spike" that symbolized completion of the first transcontinental railroad. Also, like the two locomotives that met at the juncture of the railroad to represent east meeting west, two Minnesota National Guard Trucks met at this juncture of I-90. I-90 is the longest and northernmost east-to-west, coast-to-coast interstate. Driving at 70 mph it would take 44 hours to travel it's length. We did find one other adventure that was a little closer to home. 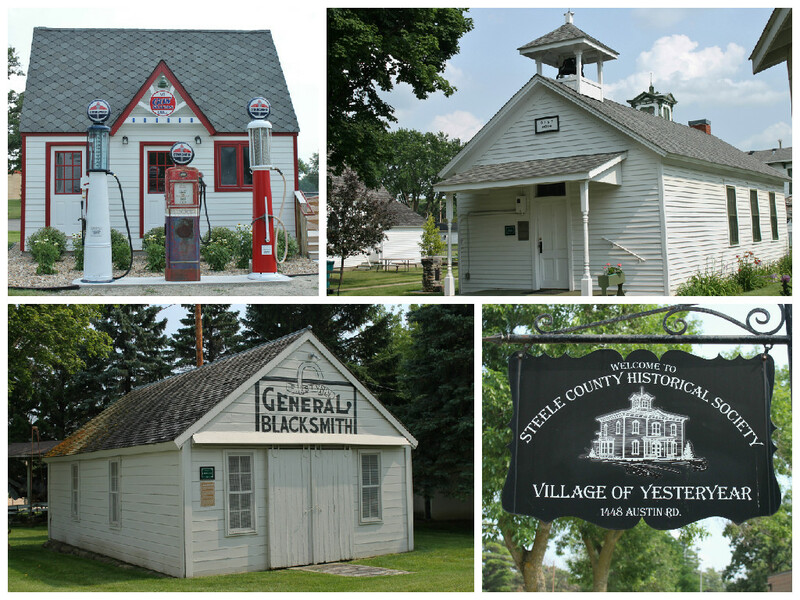 We headed east to Owatona, MN to see the Village of Yesteryear. On our way there we saw a sign for the Historical Village of Ottawa so we made a little detour to see what it was all about. After following the signs we were a little confused because there was one building, an old town hall. After reading the map we found at this building we realized that there really wasn't a village anymore, just empty lots that the map described what used to be there. Out of 26 places listed on the map only 3 exist today. Like usual though it wasn't a total bust, we learned about free library boxes, take one or leave one. We have since seen a number of these in our travels, such a cool idea. Also, we came across these cute cows swimming in a pond. Okay, so more standing than swimming. 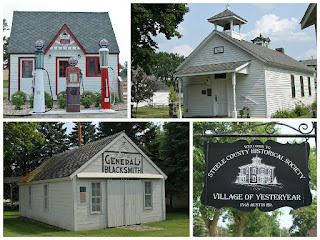 We did make it to Owatona and the Village of Yesteryear which was much better than the Ottawa Village. 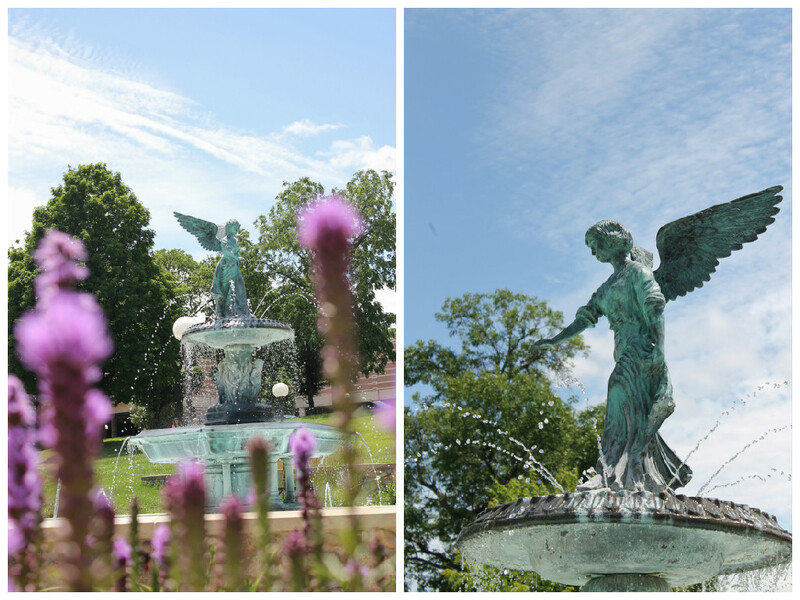 We enjoyed a leisurely stroll through the grounds and learning a little history of the area. Reminded us of Greenmead in Livonia, MI. Once again so many things accomplished in one stop. As mentioned earlier, a stop at the Grotto of Redemption in West Bend, Iowa was also in this stay but it was such an amazing place it requires its own blog. ~ It is important when you pull into your campsite and are setting up that you open all of the cupboard doors to make sure nothing has shifted in transit. Checking them at that point you are aware and careful. Opening one a day or two later you are not as careful and you can end up with things falling out on you and scaring you half to death. ~ When making dinner the day before a travel day make enough for leftovers, or cook something extra so after you pull in and set up and are exhausted, you have dinner ready without a lot of work or time involved.